Acton Lake Acton Lake is found in Butler and Preble Counties. It covers 5.625 acres of fishing water with 8 miles of shoreline. This lake is in Ohio Division of Wildlife District Five(5). Location In Delaware and Preble counties on the southwestern edge of Ohio. Four miles from the Indiana/Ohio state line. 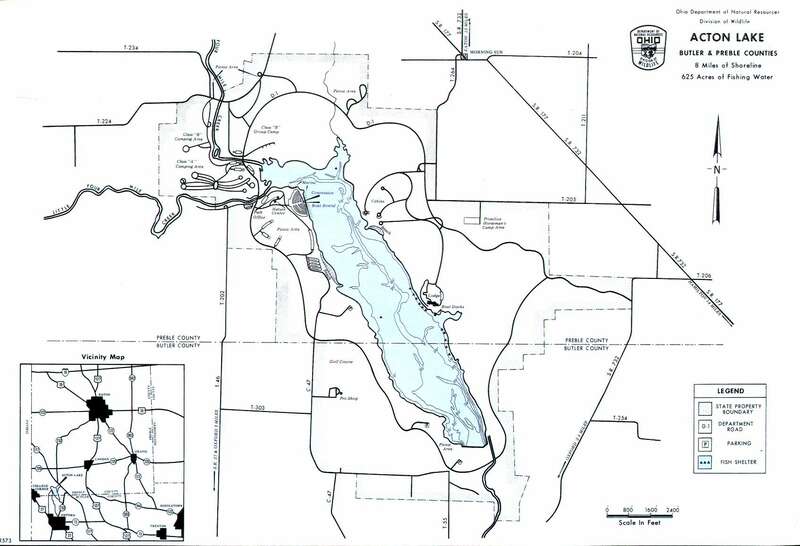 The lake is accessible by State Route 177 – SR 732 – SR 725 – U.S. Route 27. Distance from Major Cities 7 miles north of Oxford. 40 miles northwest of Cincinnati. 35 miles southwest of Dayton. Fishing Opportunities Acton Lake fishing action includes; *Largemouth Bass *Bluegills *Muskellunge *Tiger Musky *White Crappie *Channel Catfish *Bullheads. Boating Information There is a boat rental and marina. Horsepower limited to 10-hp. State Management The State Park is 3596 acres and surrounds Acton Lake. Ohio Division of Wildlife activities include ~ stocking ~ constructing of fish shelters ~ population monitoring ~ water quality analysis. ODNR has stocked the species listed above. Bass must be 15".